For the last three years The Nature Channel in Holland have been running a live feed from an artificial nest bank in Helmond. 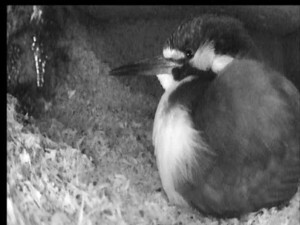 The Dutch Kingfishers are the same species, “Alcedo atthis”, that we have in the UK, and the webcam provides a unique opportunity to observe activity inside the nest chamber throughout the breeding season. I use Google translate to navigate the site, or you can just click on the IJsvogelnest link to see the view inside the nest (Broedwandcam1 shows the outside of the nest). The site is entirely free to view, but if you end up spending a lot of time viewing their live cams you can make a voluntary donation to help with the running costs on the site.